The Basalt High School seniors celebrate after the conclusion of their graduation ceremony on Saturday. 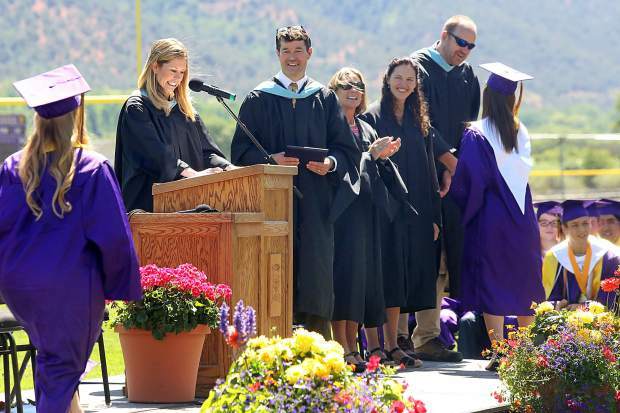 Students begin to recieve their diplomas during Saturday's graduation ceremony at Basalt High School. 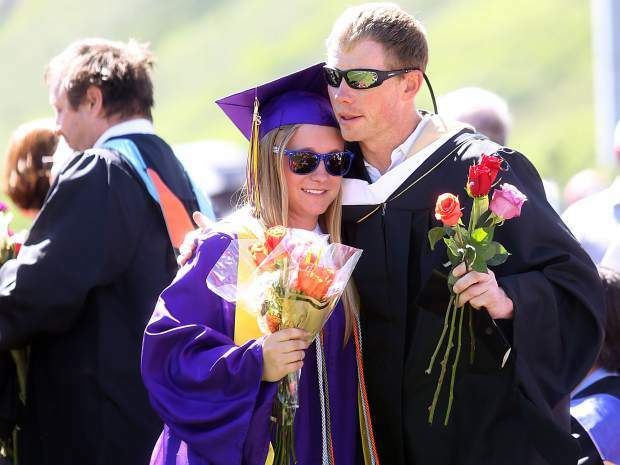 Teacher Ryan Bradley, right, hugs Basalt High School senior Kate Schrock during Saturday's graduation ceremony. Basalt seniors Stephanie Nevarez Ramirez, left, and Tyler Jackson were this year's Wall of Fame award winners. 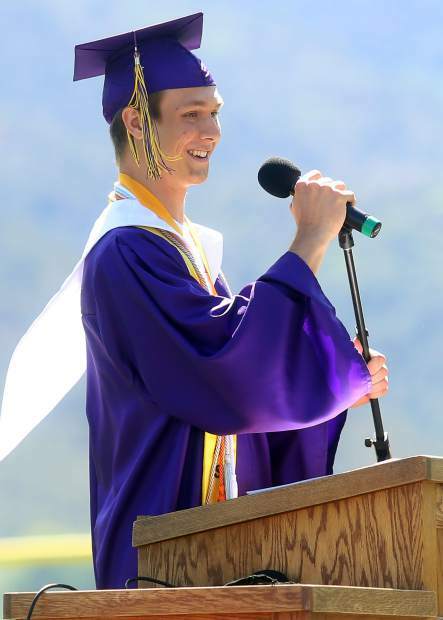 Co-valedictorian Drew Olson speaks during Basalt High School's graduation on Saturday. 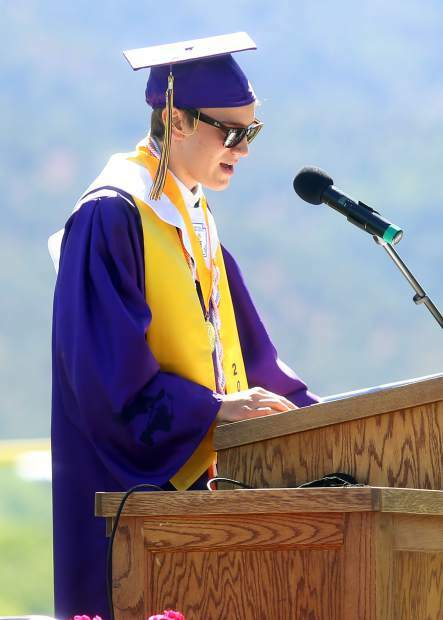 Co-valedictorian Will Orben speaks during Basalt High School's graduation on Saturday. The Basalt High School chamber choir sings the national anthem during Saturday's graduation ceremony. 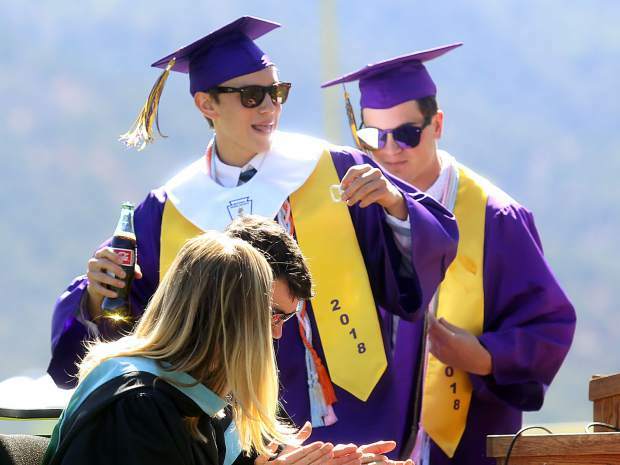 Co-valedictorian Will Orben dances off the stage with a bottle of coke during Basalt High's graduation on Saturday. After a brief interlude to figure out how to work the microphone stand, Drew Olson launched into his speech. 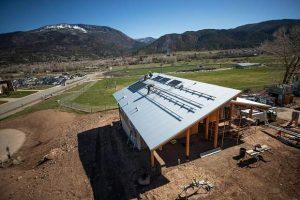 Or at least, that was the idea for the Basalt High School senior during Saturday’s graduation ceremony on the BHS football field. 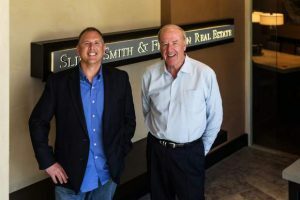 “What am I suppose to say to a group of people I’ve known for my entire life that will send you out of this town with ambition and the desire to make the world a better place?” Olson asked. “And the answer is, I have no idea. But I’m also confident that I don’t need to know. 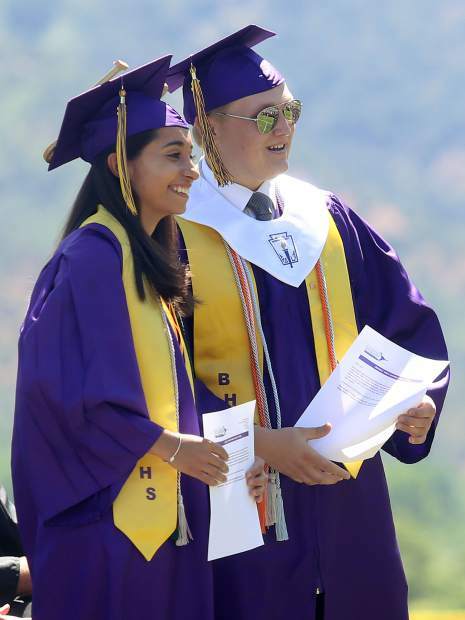 Olson, who will attend Brown University, was the class of 2018 co-valedictorian, along with Will Orben, and was one of 81 Longhorns to walk across the stage Saturday. 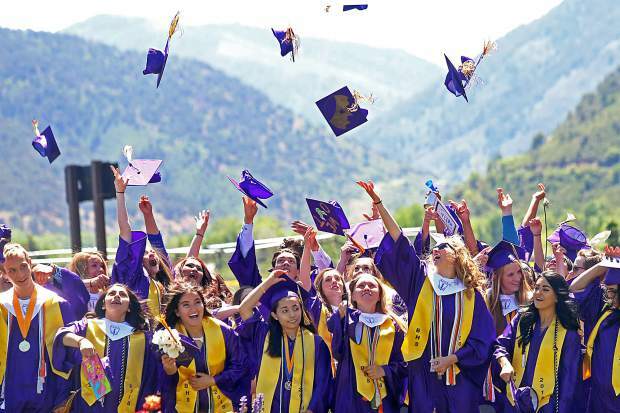 Orben, who will attend the University of Colorado, took a different approach in his valedictorian speech, advising his peers to enjoy the moment a bit more. According to Orben, the 2018 class is quite the ambitious bunch. 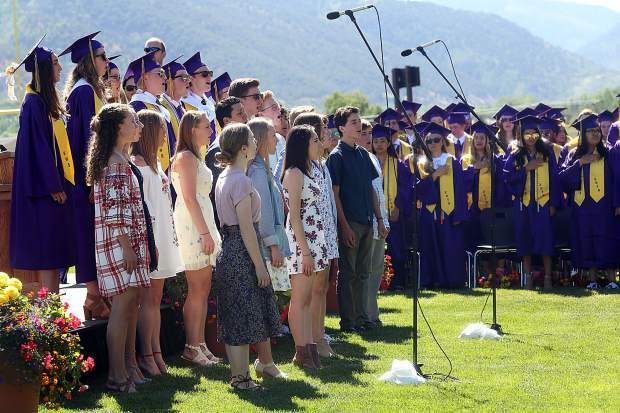 Instead of bringing in a more traditional commencement speaker, the BHS seniors wanted to stay a little closer to home and asked science teacher Brent Hayes and choir director Brittany von Stein to do the honors. The duo paired to create one tandem speech, where they emphasized the terms “stubborn, competitive and goofy” in describing the class of 2018. Following the class address, the BHS seniors added to the school’s “Wall of Fame” by recognizing Stephanie Nevarez Ramirez and Tyler Jackson. They received the award as they best expressed “the values of the class and the legacy it wants to leave behind.” Their photos will be put on display in the main hallway of the high school. The ceremony wrapped up with the traditional tassel change and cap toss, Orben’s words likely still in their minds. 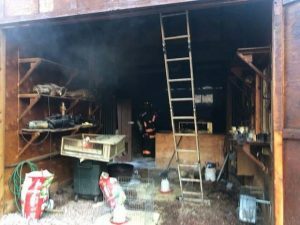 “For me, it’s clear there are a good amount of you sitting here that deserve to be in my place right now. 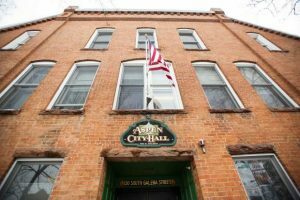 I look at this class and see a group full of capable leaders and scholars,” Orben said during his speech. “There will be times where we feel we are making all the wrong moves and things aren’t going according to the plan, but it’s important for us to remember there is no plan at all.